Objective: The goal of this study was to assess the impact of minimally invasive surgery (MIS) fellowship training on the fellows’ clinical practice as well as former fellows’ perception of their experience. Methods: A survey composed of 50 multiple-choice questions was e-mailed to 270 former MIS fellows who began a fellowship in the U.S. between 2000 and 2005. E-mail addresses were obtained from the industry sponsor of MIS fellowships (Covidien). All identifying information was kept confidential. Results: 215 of the 270 email addresses were valid at the time of the survey. 64 surveys were completed for a response rate of 29%. 88% of the respondents were male. The most frequent reason for choosing an MIS fellowship was to enhance laparoscopic skills (34%), followed by improving chances of obtaining a job in a competitive market (22%) and improving chances of becoming a future leader in the field (20%). Laparoscopic procedures currently performed by former fellows include appendectomy(94%), cholecystectomy(92%), ventral herniorraphy(84%), colectomy(83%), nissen fundoplication (83%), inguinal herniorraphy(76%), splenectomy(70%), gastric bypass(62%), lap-band(61%), common bile duct exploration(52%), adrenalectomy(49%), esophagectomy(11%). 75% reported no training experience in advanced endoscopic procedures. 85% felt completion of an MIS fellowship provided an edge on referral of advanced laparoscopic procedures. 63% reported that their presence enhanced the laparoscopic experience of surgical resident(s). 91% reported that the fellowship either met or exceeded their expectations. 75% stated that their fellowship was extremely beneficial to their career and 86% would recommend their former fellowship to future applicants. 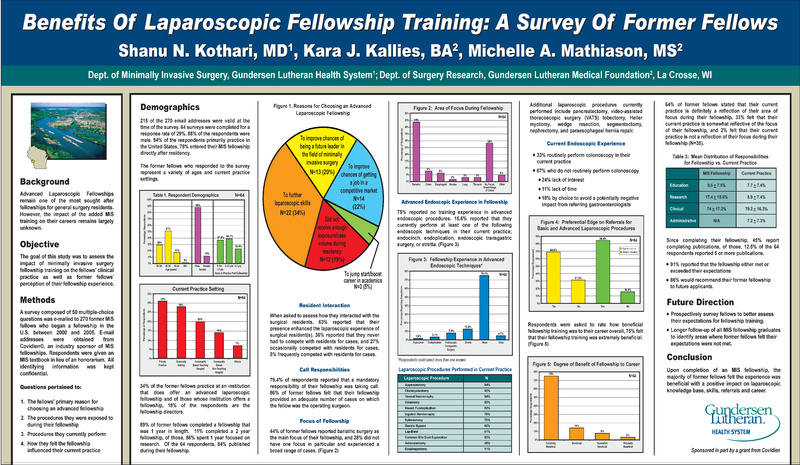 Conclusion: Upon completion of an MIS fellowship, the majority of former fellows felt the experience was beneficial with a positive impact on laparoscopic knowledge base, skills, referrals and career. Long-term followup of all MIS fellow experiences could help tailor fellowships to meet the needs of future trainees. Further study is necessary to validate these results on a larger scale.